Now to the “B Sides”. After all the important announcements were made the time came to create favors for the party. I wanted guests to walk away feeling like they went to a concert. With that in mind I had a few staple items custom made to really drive it home. Temporary Tattoos – One of my most memorable music experiences as a kid was getting Kiss Alive II for Christmas and finding a sheet of temporary Kiss tattoos in the sleeve. I knew I wanted to share that experience so I used both the logos I made for the event as well as Elvis’s iconic TCB lightening bolt. A handful of each tattoo were set out in bowls on each table for guests to play with. Included in those bowls were…. 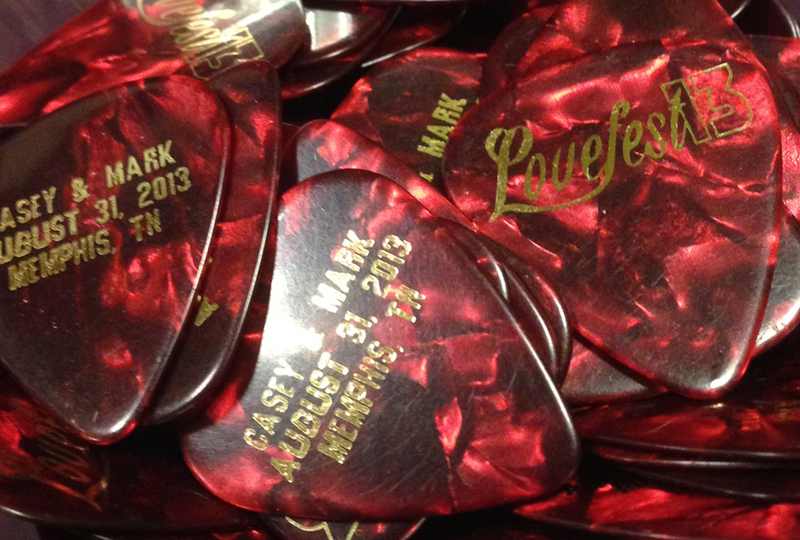 Guitar Picks – Most every wedding I have ever been to has some sort of parting gift with the couples name on it and the date of the wedding. Like a mini champagne bottle, chocolate candy bar or match book. For our wedding we thought custom guitar pics would fit the bill. 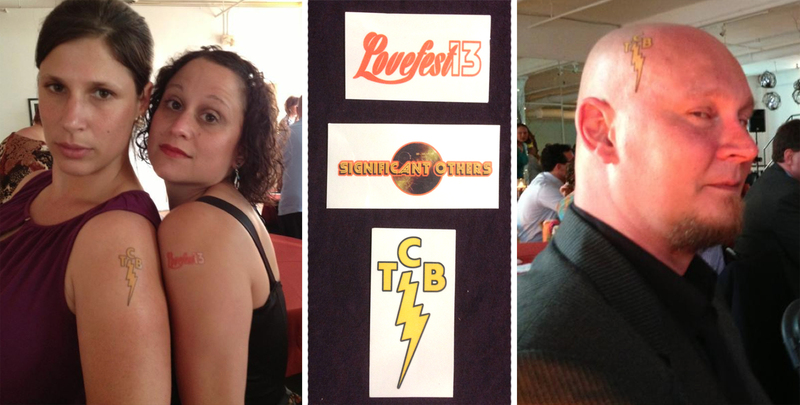 One side of the pick features the Lovefest13 logo and the other side had our names and date of the wedding. It was a small token guests could take home with them to remember the event. T-Shirts – Finally, I made iron-on t-shirts. Continuing with the idea that guests were attending a concert festival instead of a wedding Casey and I thought it would be a great if we could give out “Tour Shirts” at the end. 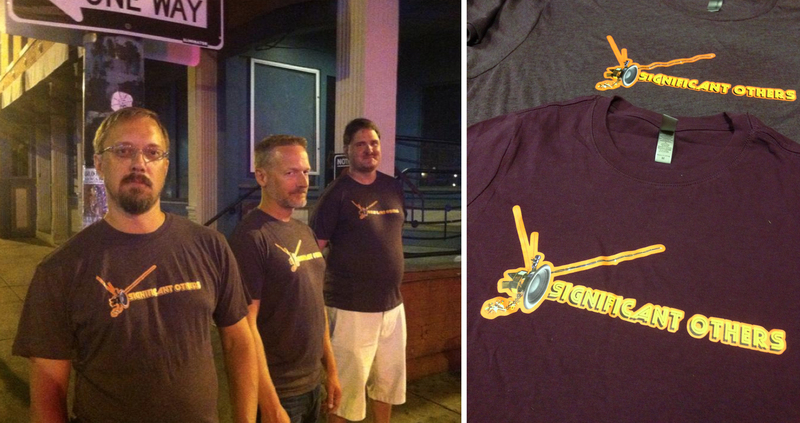 It was important to me that these t-shirts be comfortable and functional. I wanted guests to want to wear them, rather than just commemorate the event. I chose some quality tee’s in a unique color and redesigned the Significant Others logo to feature a modified Voyager with a speaker over the dish. The wedding itself was spectacular, and I couldn’t be happier with the way everything turned out. A fun time was had by all and now I want to get married again so I can throw another party like that all over again. I want to thank everyone, especially my mother and father-in-law Steve and Peggy Copen, for indulging me on this once in a lifetime project. Thanks also to Shane Visbal for keeping the ticket, Patrick Arrasmith for photographing the cd cover and, Marc Gurreri, Marci Ackerhalt-Price and Dan Cunitz for their Facebook photos. Next up, some wedding photos.